Excitement and dread mixed with mishaps and mayhem described my emotional state leading up to New Year's Eve. It always seemed like a great opportunity for a fresh start or to start over depending on the year. Unfortunately, it never worked out. With high hopes, fancy lists and bullet points it always appeared that this would be my year. Sometimes I would even write letters condemning myself to make sure I understood the importance of the resolution of the year. Putting all my hope in my ability to carry out a "resolution" to improve something about myself or my life. That sounds like a recipe for disaster if I've ever heard one. Beth Moore says, "Some of us have so much defeat in our past that we feel we lost the race before we knew it started." Defeat was my default, so no matter how much planning went into the process, the results were always the same. 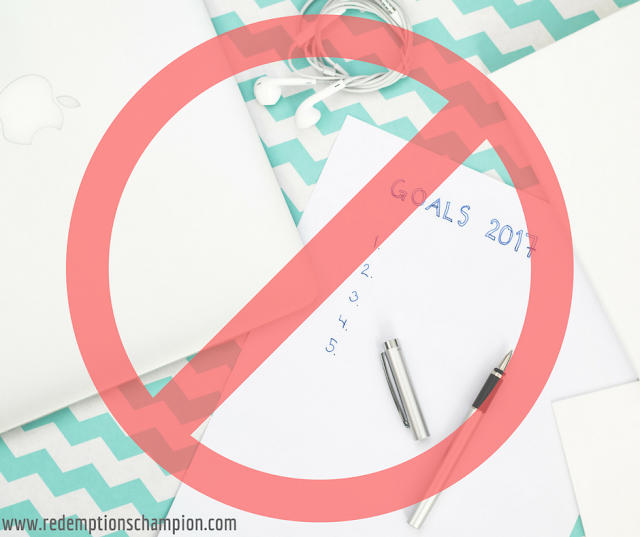 It wasn't until I sat down to write this post, did it even occur to me to question the origin of "New Year's resolutions." It's roots are steeped in Babylonian tradition. Thank God He doesn't give or withhold based on our faithfulness or ability to keep our word to ourselves. Although He is clear that it is better to say you are not going to do something then to say you are and don't. "It's all about me," is a Babylonian mentality, which I adapted in my New Year's resolution planning, without even realizing it. God was removed from the equation. Even after giving my life to Him it never dawned on me to pray about New Year's resolutions. New Year’s Eve 2015 greeted me with anxiety. The fear of repeating the events of the past year was overwhelming. Would I let the anxiety catapult me into a year similar to the one I was bidding farewell, or would I open my heart to my Father to transform the upcoming one? That in itself was a scary proposition. The temptation to give in to fear came from years of practice, but this time I made a different choice. In the face of fear I surrendered and asked my Father for a plan (James 1:5). After all, doing things over and over again expecting different results is insanity and I'd had enough of that (2 Timothy 1:7). The Lord was clear in His directive for me to start the Love Dare for Parents and have everyone in our home pick a word for the year. My personal goal although seemingly clear and straightforward proved to be challenging. It exposed things in my own heart that need to be healed and pruned. Day 1 of The Love Dare is “Love Blooms” and instantly I was challenged, which is how my word became so clear to me, “NURTURE.” For some it may be the simplest of dares, but as I read it, my own woundedness and imperfections were obvious. I was grieved at how difficult it was to complete the day's dare, but with my word, nurture, before me it was more about working on that part of my character than completing a dare and checking it off a list. Looking back over the year I could see more growth, having just one word from the Lord, rather than a list of high and lofty expectations for myself. I am learning that, in fact, He does instruct me in the way I should go. (Psalm 32:8) I have only to trust and obey. Do you have a word this year? I'd love for you to share it. You can leave it in the comments here.